Some people mistakenly think that while brushing, a bleeding tooth is perfectly normal. It is not. Anytime there is any bleeding in the mouth, it is almost always a sign of periodontal disease. Even if you brush fairly hard, it should not cause healthy teeth and gums to bleed. If you are experiencing a bleeding tooth, or bleeding in any part of your mouth, you should schedule a visit with a dentist as soon as possible. Some people put off such a visit, because they fear it will be painful. While sitting in the dentist’s chair is not the most comfortable experience in the world, getting a bleeding tooth checked out sooner rather than later can save you even more time in the dentist’s chair. By putting off a visit to the dentist, you take the chance of allowing whatever is causing the bleeding to progress. This can result in more in-depth - and therefore more painful and expensive – treatment. It can also result in tooth loss. During that first visit to a dentist, he will likely do a visual examination of your mouth and take some x-rays. By doing that, he will more than likely be able to determine the cause of your bleeding. From there proper treatment will be recommended. There is no one treatment that will be right for all causes of a bleeding tooth. Instead, your care will need to be customized to suit your specific problems. 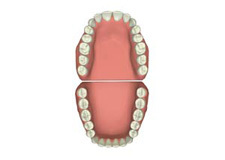 There are some cases where a bleeding tooth will be the result of a trauma. The trauma could be dental work or an injury caused by being hit in mouth area. If the cause of the bleeding is dental work, keep in mind that such bleeding should not continue for more than a day. If your mouth is still bleeding the day after the dental procedure, you need to contact your dentist immediately. For trauma, you will need to decide if you are going to go to the dentist. If any teeth seem to be knocked loose, or are cracked or chipped, you absolutely need to make an emergency appointment with the dentist. The sooner you can be seen, the higher the chances that the dentist will be able to save the tooth. The longer you wait, the fewer options you will have for treatment. Another question regarding a bleeding tooth that many have is about bleeding when a baby is teething. Most parents will not see any blood associated to new teeth breaking the surface. However, some parents do notice a small bit of blood. A very small amount of blood is not by itself cause for concern, but you should watch the gums. If they appear to be swollen or if the bleeding continues, you need to schedule a dentist appointment for your baby right away. In most cases, a bleeding tooth is not cause for alarm, but it is not something that should be ignored. Absent of some sort of trauma, your teeth and gums should not bleed at all. If they do, you should make an appointment with your dentist to pinpoint the cause.